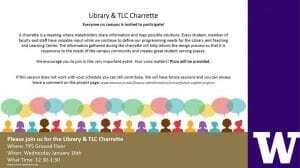 Please consider attending the Library & TLC Charrette! As part of the SNO-TLB Planning Process, the campus is invited to give input on the space planning needs for the Library and TLC at upcoming charrette. A charrette is a meeting where stakeholders share information and map possible solutions. Every student, member of faculty and staff have valuable input while we continue to define our programming needs for the Library and the Teaching and Learning Center. The information gathered during the charrette will help inform the design process so that it is responsive to the needs of the campus community and creates great strident serving spaces. We encourage you to join this very important event. Your voice matters! Pizza will be provided. If this session does not work with your schedule you can still contribute. We will have future sessions and you can always leave a comment on the project page. I started here at the University of Washington, Tacoma in 2015, and I anticipate graduating with my Master’s in Social Work in 2020. A nontraditional first generation student, I distinctly remember as if it was yesterday how frustrated I was with trying to navigate this seemingly small campus. At first the only common area that felt familiar, safe, and vital to my success as a student was the UW Tacoma Library, Snoqualmie Building. options to check out laptops, calculators, markers, chargers etc. More importantly, I had immediate access to a myriad of research databases with the added pleasure of having library staff nearby to help. A majority of my undergraduate academic studies have been based out of the UW Tacoma Library. I feel at home here. Staff have started to greet me by first name as if I was a part of the team. Now as a graduate student, I feel that the Snoqualmie Building is more than ever vital to my success. Library staff are always looking for innovative ways to address and expand the needs of the students without disrupting the harmony of the space. For instance, just this year they have added color printing as an option, and have extended their hours Monday through Thursday until midnight. This meets the need of many current students. The Library is great space for me, since I learn best when I have access to everything mentioned above. Despite the fact that there are about 5,300 students on the UW Tacoma Campus, the UW Tacoma Library is well equipped to handle the diverse needs of the student body. This is why I feel that it is essential that the Snoqualmie Building remain a part of the UW Tacoma Library. UW is nationally known for its student success and faculty research. Having access to the Snoqualmie Building and other classroom buildings is imperative to the ongoing success of this university. Moving it will hinder this easy access and will disrupt the heart that makes this university beat.